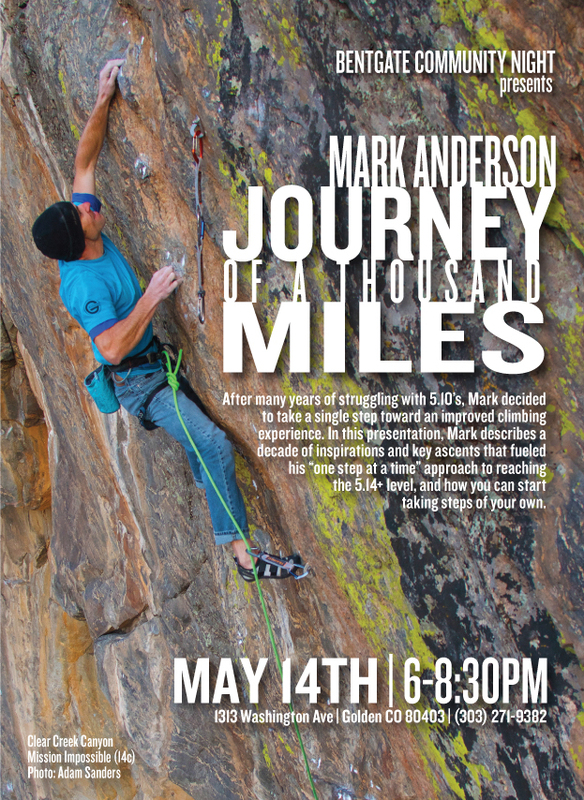 Slideshow in Golden, CO, May 14th @ 6:00pm! I will be presenting a slide show at Bent Gate Mountaineering’s Community Night on Wednesday, May 14th. Festivities run from 6:00-8:30pm. Here’s a Google Map of the location. I’ll be talking about how I evolved from a novice climber to my current level, and key ascents that inspired me to improve along the way. In particular I’ll be talking about some of the hard milestone climbs I’ve done recently like Mission Impossible. There will be loads of SWAG–Trango has been extremely generous and will be giving away a Rock Prodigy Training Center as well as a few rope bags and other goodies. There might also be a very special RCTM celebrity guest (TBD). It promises to be a good time, and I hope to see you there! The holidays are upon us, which means friends and relatives will soon be pestering you for your wish list. 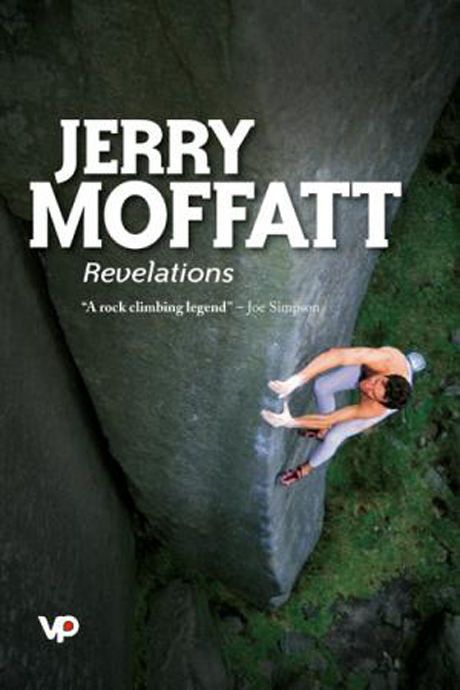 If you don’t already have it, I highly recommend asking Santa for a copy of Jerry Moffatt’s outstanding autobiography Revelations. Jerry Moffatt was probably the best climber in the world for most of the 1980s, and he continued to push standards throughout the 90’s. He was integral to the explosion in free climbing standards that occurred during the 1980s. He was also a highly accomplished trad, headpoint, and solo climber and perhaps the best on sight climber of his generation. While Moffatt’s story is a fascinating and entertaining read in itself, I mention it here because the book also offers countless insights for the performance-oriented climber. Moffatt was among the first climbers to really embrace training, and he goes into considerable detail explaining how he trained for different objectives. He also recounts the legendary characters (like Bachar and Gullich) that influenced his ideas on training, while discussing his thought process when developing training plans for different goals. Moffatt possessed legendary focus and determination. He dreamt big, but he backed up his dreams with hard work and tremendous effort in the moment of each ascent. His book describes in detail how he approached stressful performance situations (like the first On Sight ascent of the Gunks’ Supercrack and World Championship competitions). Any climber, of any ability, can benefit from these lessons. While Moffatt was often head and shoulders above his peers, he was not superman. He provides a glimpse into an elite world that most of us will never experience, yet his story is very relatable. He frankly describes his various injuries and accidents, humanizing himself while tackling the frustration and despair that comes with any setback. He confronts many of the same challenges we all face on our own paths to continuous improvement, giving us real hope that we can overcome them too. I’ve read the book cover-to-cover three times now, and I will surely read it again. 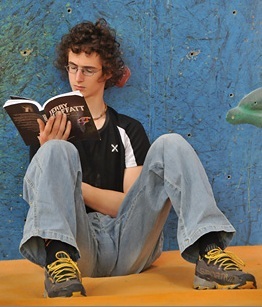 Its hands-down my favorite climbing book. His trials and eventual triumphs never fail to motivate me, and should give you the extra boost you need to fire up your winter training sessions. – Wolfgang Gullich: Life in the Vertical by Tillmann Hepp. This biography of the world’s most beloved climber is now out of english print and therefore correspondingly rare and expensive. However, if you can get your hands on a copy you won’t be disappointed (check your library or ask around–the AAC Library in Golden has a copy). In addition to recounting Gullich’s countless ground-breaking ascents, the book also discusses his training methods, tactics, and attitudes, including several interviews and short pieces penned by Gullich himself. – Beyond the Summit by Todd Skinner. This book describes Todd’s quest to free Trango Tower, but also details his development as a climber and other groundbreaking ascents like the Free Salathe Wall. As a training tool, this book will help you with goal-setting and motivation. – A History of Freeclimbing in North America: Wizards of Rock by Pat Ament. This tome is an encyclopedic catalogue of noteworthy ascents from 1869 to 2001. It’s not the kind of book you would normally read cover-to-cover, but many of the entries include long, first-person accounts from the players themselves. It’s absolutely essential for any lover of climbing history, but it also has some good insights for the performance-oriented climber, such as interesting training and tactical tidbits from legends like John Bachar, Tony Yaniro, and Alan Watts. Ament’s occassionally editorializing on style comes off as petty at times, but it’s generally easy to ignore. If you have any other recommendations for books that offer a bit more than an entertaining read to get us through the long winter, please post them in a comment below. Climb Talk Radio AM1190 Friday Night! The show is scheduled to start 9pm Mountain Time, but we are following a live broadcast of a basketball game, so we could get pushed back a bit if the game goes long. We will be talking MountainProject, Shelf Road, First Ascents and Training. There may be a few curveballs as well. I hope you can listen in!